God is my portion, and my cup: Advent -- Our Savior Is Born For Us! Give Our Highest Adoration. 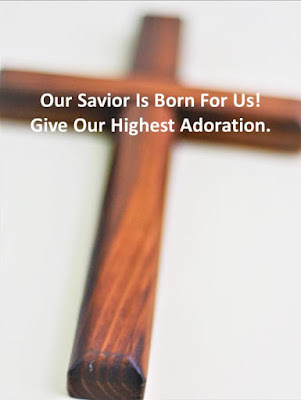 Advent -- Our Savior Is Born For Us! Give Our Highest Adoration. During the reign of King Herod, three wise men from eastern lands came to Jerusalem. They watched over stars years, and saw a star that they waited for years according to the prophecy of birth of the King of the Jews, the Messiah. As soon as they saw the saw, they joyfully left their country to follow the star. The star led them through hills, mountains, wilderness, and deserts. It was not an easy journey. They had to fight against fears of the darkness of those deep nights, and endured harsh weathers that they met. However, their eyes were fixated on the star leading ahead of them. They went through unknown towns and peoples of strange tongue and languages. They felt multiple times danger while passing through those towns. However, some town people came out and welcome them kindly to provide water and food. They even offered place to stay overnight, which made them refreshed through their journey. In turn, they expressed thankfulness by sharing their small gifts before leaving the town. Then again, they followed the star. 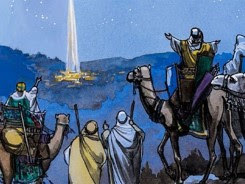 Their journey was full of ups and downs, but their minds were firmly set on the star while expecting to meet the new King, the Messiah as prophesied long ago. Their joy and hope to see the new King were always greater than their hardship, toils and fears along the journey of following the long-waited star. As they were getting closer to Jerusalem, from far, they could see the walls surrounding Jerusalem, and the buildings in the city. They were excited, and their hearts were filled with joy. Finally, they found the destiny. They thought that they could find the new born king in Jerusalem. As they heard about Jerusalem, it was a huge city where many kings ruled from. As getting closer to Jerusalem, they quickly realized that it was not so easy to find the newborn King. Jerusalem was really big, and it was very easy to get lost. They were just strangers, who had no idea even how to go to see the newborn king. and teachers of laws were, but he also cautioned that King Herod was not a good king, but a notoriously ruthless tyrant. 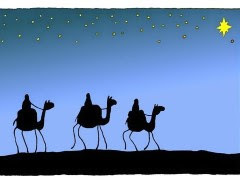 The three wise men set down and discussed, “Would it be a good idea to ask King Herod about a newborn king of the Jews? 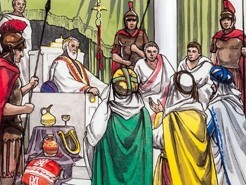 Isn’t King Herod the current king, who rules over the Jews? If we ask a newborn king of the Jews, how would the current king respond? Should his son succeed his kingship? In King Herod’s point of view, there should be only one king, himself, and his son would be the future king succeeding him. Apparently, there is no newborn son in King Herod’s family. Then it means the newborn king of the Jews is the one not of his bloodline. Is it a good idea to ask about a newborn king of the Jews? It will certainly upset the king. 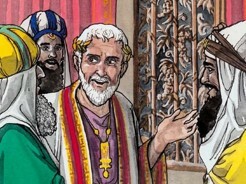 We were also told that King Herod is a notoriously ruthless tyrant.” Then they looked each other’s eyes. A dead silence fell. It took quite a time before breaking the silence. One of the wise men stood up, and said, “We made a long journey to here Jerusalem following the star to meet and worship the newborn king of the Jews. Therefore, the newborn Messiah should be close to where we are now. We are very close to our destination. Indeed, the last thing between us and our meeting of the newborn king is our fear of King Herod. Asking about the newborn king, who is other than his own son, would certainly put us in a big trouble. However, let’s think back. How many times have we gone through dangers of people and fears of nights during our journey? Numerous. Sometime, we thought that we were doomed, but in fact we were not destroyed. Instead, we were protected by the divine power. This is the reason why we are here now. Don’t we not see the pattern that the divine guidance and protection throughout our journey? God must be with us. Why are we in fear of King Herod? Our journey to meet the newborn king will be surely accomplished. After all, our journey to Messiah is not our own idea, but the prophesy of God. God has taken us to here in Jerusalem, and He will continue guide us to the newborn king. I am sure we will see the newborn king of the Jews, the Messiah, the Savior.” The other two were attentively hearing this, and then they nodded. King Herod was deeply disturbed when he heard this. However, he could not show his emotion because he was surrounded by his nobles and solider and he first offered his kindness. He, then, excused the three wise men to leave the room. Then the king called a meeting of the leading priests and teachers of religious law and asked, “Where is the Messiah supposed to be born?” He did not even want to use the phrase sued by the strange visitors, “the newborn king”, which directly conflicted with him and his kingship. Instead, he used only “the Messiah” in his question. The evil was really closely chasing the birth of the newborn king of the Jews, the Messiah. However, God continuously guided and protected the three wise men’s journey, and the newborn king of the Jews, the Messiah and the Savior. After this interview the wise men went their way. And the star they had seen in the east guided them to Bethlehem. (Bethlehem is about 9 Km [about 6 miles] south of Jerusalem.) The star went ahead of them and stopped over the place where the child was. When they saw the star, they were filled with joy! They entered the house and saw the baby wrapped and laying in the manger. Mary and Joseph were with the baby and surrounded by the shepherds and animals in the stable. Finally, they met the newborn king of the Jews, the Messiah and the Savior in the manger. The newborn king was not in the palace, where King Herod was. The newborn king, the Messiah was in the manger as a humble king. The three wise men saw this stark contrast between the palace King Herod surround by gold and silver and the humble king, the Messiah in the manger with straws, shepherds, and animals. Then the three wise men humbly bowed down and worshiped the newborn king in the manger. They just gave some respect to King Herod, but they truly implored themselves before the newborn king. They offered their deepest adoration to the newborn king, the Messiah. Then they opened their treasure chests and gave him gifts of gold, frankincense, and myrrh. Their minds were quickly passed by their vivid memories of the past events of protecting these precious gifts from the thieves and robbers while risking their lives. However, God was with them, and God protected their lives and the precious gifts. Yes, finally, they saw the newborn king in the manger, and the precious gifts were with the newborn king, the Messiah and the Savior. Their hearts were truly filled with joy and adoration, which could not be compared with anything else. Yes, it was a really good news, and it brought a great joy to all. Finally, the salvation promised long ago came. 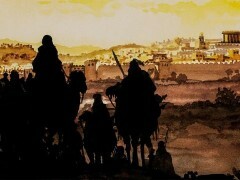 The long journey of the three wise men was ended when they saw the newborn king, the Messiah and Savior. Our long journey for deliverance and salvation also has ended because of the newborn king -- our Savior and Messiah, who deliver us from our misery and sins. Be glad and joyful! Our King, the Messiah was born for us. He is our Savior and the LORD! Give praise Him forever and more! Praise Him!